Boardwalk Hydrospun Wipers, White, 9 x 16 3/4, 10 Pack Dispensers of 100, 1000/Carton. 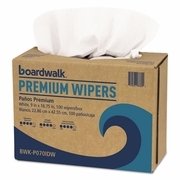 Choose the strength and absorbency of durable hydrospun wipers for your everyday tasks. They are sturdy, with a cloth-like feel. Solvent-resistant for difficult work. Ideal for surface prep, cleaning equipment and tools. Great alternative to shop towels. Sold by the individual pkg of 100 wipers.